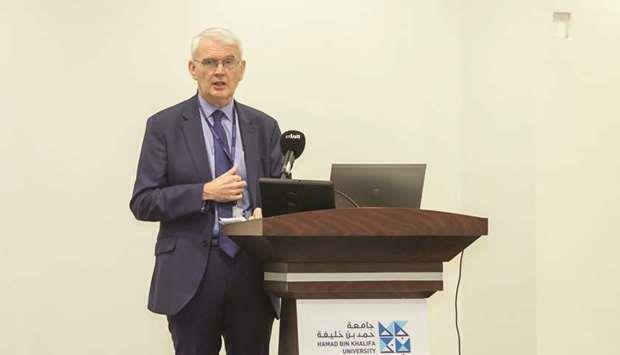 (MENAFN - Gulf Times) Qatar Environment and Energy Research Institute (Qeeri), part of Hamad Bin Khalifa University (HBKU), recently hosted the third World Scientific Panel on Food-Water-Energy Nexus (Sunex) and stakeholders' meeting. The project, helmed by Belmont Forum, brought together experts from Doha, Berlin, Bristol and Vienna to discuss best practices and the food-water-energy (FWE) nexus in each of the cities. Dr Mohamed Saif al-Kuwari, assistant undersecretary and director of the Environmental and Municipal Studies Institute at the Ministry of Municipality and Environment, and Dr Abdulkarem Amhamed, senior scientist at Qeeri, represented Qatar in the meeting. The Qatar National Research Fund supported the Qatari delegation. The meeting also served to establish how Qatar could potentially become a role model for countries in the region. During his opening address, Dr Richard O'Kennedy, vice-president for research at HBKU and vice-president at Qatar Foundation Research, Development and Innovation, said: 'The FWE nexus project is crucial for us to assess the impact of extreme climatic events, coastal vulnerability, water security and global urbanisation. Together, representatives from the four cities were able to share information, data and scientific studies in order to accelerate progress, and to develop efficient and economic solutions to these challenges. Dr al-Kuwari said, 'Concerns in the FWE nexus exist across the world, and it is imperative that we work together with our stakeholders nationally and globally. This meeting provided a platform to share ideas and listen to different perspectives and to intensify our combined efforts in developing tangible solutions that positively impact our respective countries. Sharing his thoughts on the event, Dr Marc Vermeersch, executive director at Qeeri, noted: 'We are delighted to host this event as Qeeri's mission is to assist Qatar to tackle the grand challenges related to energy, water, environment and sustainability. This Sunex project helps us strengthen our global partnerships and enhances collaboration within the various entities in Qatar such as the ministries, research institutes, and oil and gas companies to reach our shared goals. Qeeri's mandate focuses on research, development and innovation aimed at addressing Qatar's challenges and priorities.